Even a short walk can clear the mind and improve the spirit. I wrote an entry recently titled “Once A Teacher, Always A Teacher” and in it I also included some writing tips. At the end of each step I added the phrase, “go out and play”. I intended to write a follow up piece about the benefits of going outside and playing but it seems the Columbus Dispatch beat me to it. I opened the paper a few days after my blog entry to see this headline “Prescription for healthy kids: Go outside and play”. It seems I am not the only one to recognize the benefits of being outside, in fact, there is a whole national movement to encourage kids to leave their computers, iPods, HDTVs, Xboxes, and other electronics and go outside for some fresh air and exercise. According to the Dispatch article and the Kaiser Family Foundation, today’s kids are spending an average of seven hours and 38 minutes a day, or more than 50 hours a week, watching TV, playing computer games, or on the computer. This is an astounding statistic. In response to this, a new national movement has begun called Leave No Child Inside. In Ohio this movement is backed by Gov. Ted Strickland and the Ohio Department of Natural Resources. The Leave No Child Inside coalition also held a rally in Columbus where they released a report showing how the change in lifestyle is creating more obesity, vitamin D deficiency, myopia and stress. The national movement began in Cincinnati as a response to Richard Louv’s book Last Child in the Woods which addresses the growing disconnect between children and nature and a phenomenon he calls nature deficit disorder. Locally, the movement recognized Dr. Wendy Anderson-Willis, a pediatrician at Nationwide Children’s Hospital who actually gives prescriptions to play outside for at least an hour each day. 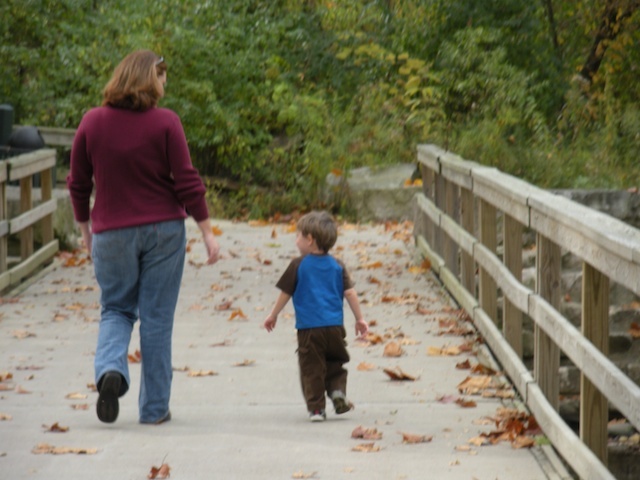 The Leave No Child Inside movement encourages outdoor activities such as bike riding, walking and going to a neighborhood playground or park. They say these activities benefit children physically, intellectually, emotionally, and socially. My personal research suggests outdoor play and activities also benefits children with attention deficit. I am of the generation that remembers what the world was like before computers and, unlike many my age, I have fully embraced the modern age. Computers have improved our lives in so many ways I can’t imagine going back to “the good ole days”. But at what costs are we making these advances? I remember coming home from school and racing outside to play before dinner and homework. That time outside always seemed to clear my mind and refresh me before hitting the books again. For some reason I was always able to think clearer after time outside. I worked part time while going to college and walked from my classes to my job. That walk always cleared my mind, gave me time to think about what I learned that day, and digest the material before entering a different world of working with customers. Even today a brisk walk is part of my routine, especially when faced with a problem or as a break to sort out my writings. I own two dogs and one of the reasons I chose to be a dog owner, besides my passion for rescuing dogs, is that it forces me to go for a walk twice a day. No matter the weather, we are there—the dogs briskly walking in front, tails proudly waving and noses sniffing the breezes. Even through last year’s horrendous winter of snow and ice, we continued our daily walks. A neighbor complimented me on my dedication but my reply was, “I have no choice. The dogs don’t understand if I say we aren’t going out today because the weather is too bad.” Hot sun, snow, sleet, these are all nature’s way of reminding us we are alive. When dressed appropriately, the elements should not be a deterrent to enjoying the out of doors. As a kid we rode our bikes, played badminton and football or cowboys and Indians, had pogo stick contests, took hikes, explored nature in our own yard, went sledding, climbed trees, played on swing sets, or just sat under a tree and talked. We never thought of spending much time in the house, besides our mothers always shooed us out because we were under foot. I have always thought the Native Americans had it right. They lived close to nature but also worshiped it. What they took from nature, they replaced. Land ownership was not a part of their world because no one could own Mother Nature. It was only when the white man came to this land and began establishing cities and factories that the balance of nature was upset. It took modern mankind only a couple hundred years to upset the harmony the Indians had established with the earth over many centuries. Today we are paying for this disconnect with obesity, high blood pressure, and diseases. So, the next time you begin to stress out, leave the cell phones, computers, TVs, and all other forms of electronic entertainment behind and go outside and play. Feel the sun on your face and the wind at your back. See the brilliant array of colors in the various greens of the trees and grasses; or the reds, pinks, oranges, purples in the flowers that adorn porches and walks. Hear nature’s symphony as the birds and insects sing their melodies with the wind blowing through the trees providing the rhythm section. Take a deep breath and smell the perfume of abundant flowers or the musty fragrance of the forest floor. Taste the snowflakes on your tongue. God, the greatest artist of all, has provided all this to restore our souls. So, go outside and play and feel really alive once again.